Prickly chayote is small to medium in size, averaging 10-20 centimeters in length, and has a pear-like shape with deep linear indentations, folds, or puckers and many green-gold spines covering the surface. The number of spines will increase as the squash matures on the vine and the pale green rind is firm and is often discarded because of its tough nature. The creamy white flesh is crisp, and the central core contains one small, flat, edible, and light tan seed. Prickly chayote squash is crunchy and mild with a light, sweet flavor similar to a cucumber. In addition to the fruit, the leaves, shoots, flowers, and roots of the Prickly chayote are edible and utilized in culinary applications. Prickly chayote squash can be harvested year-round, with peak harvests in the fall and occasionally in late spring. Prickly chayote, botanically classified as Sechium edule, is the fruit of a tropical climbing vine and a member of the Cucurbitaceae family along with gourds, cucumbers, and melons. Prickly chayote is one of several varieties of chayote that each have a slightly different color, shape, and texture, but they all contain a similar mild, flavor. In the commercial marketplace, the pale green, smooth chayote is more common to find than the Prickly chayote, as removing the spines can be time-consuming. Prickly chayote squash is used around the world in many different cultures and is predominately used as a carrier to soak up accompanying ingredients. 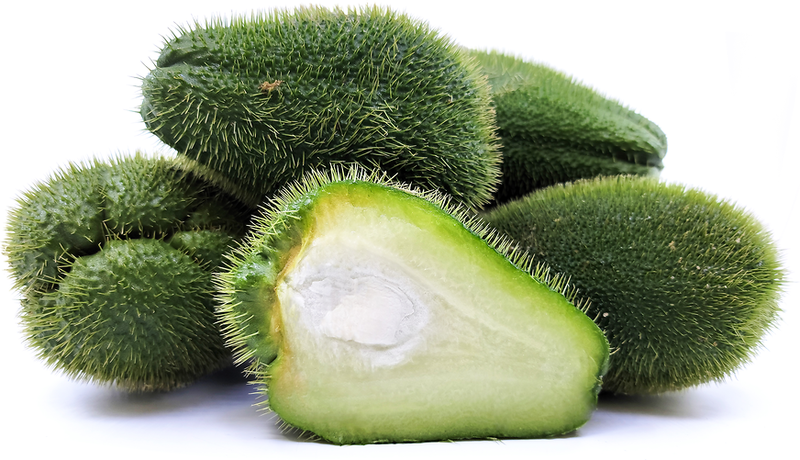 Prickly chayote is high in potassium, magnesium, folate, and also contains vitamin C and B6. Prickly chayote is best suited for both raw and cooked applications such as grilling, steaming, baking, sautéing, stir-frying, and boiling. Seasoned chefs will note that Prickly chayote is preferred over smooth chayote for their sweeter flavor and firmer flesh. Prickly chayote can be used raw and sliced thin or shredded in both green and chopped salads. It can also be roasted and added to soups, curries, and stews, grilled and served as an accompaniment to main courses featuring pork and poultry, deep fried, or used to make pickles and chutneys. Prickly chayote pairs well with chile peppers, tomatoes, cream-based sauces, bacon, curry, mole, garlic, onions, both soft and hard cheeses, melon, cumin, coriander, oregano, cilantro, lemon or lime juice, nuts such as pistachios, pepitas, and almonds, legumes, and coconut milk. When handling the raw fruit, it is recommended to wear gloves or to peel or slice the fruit in water as the squash secretes a sticky, nontoxic residue which may cause some irritation to sensitive skin. The blossoms of the Prickly chayote can also be utilized in a fashion similar to that of zucchini blossoms, stuffed with soft cheese and fried. After two years of growth, the roots or tubers of the Prickly chayote can be consumed and are most commonly boiled, roasted, or fried. Prickly chayote will keep up to four weeks when wrapped in a paper towel, placed in a plastic bag, and stored in the refrigerator. Prickly chayote was a staple fruit in the diet of the Aztecs in Central Mexico, and they were one of the first cultivators of the vining plant. The name chayote has Spanish origins and comes from the Nahuatl word “chayotli” which means spiny gourd. As explorers encountered chayote in Mexico, they brought the excellent storing fruits on their voyages and spread them across the Americas and to Europe. Prickly chayote was also grown in the United States during the 1850’s along the eastern seaboard as a home garden crop up until the Civil War which halted cultivation. When it was reintroduced in 1890, it was marketed temporarily under the name vegetable pear, a nod to its unique shape and flavor and to distinguish how to prepare the fruit. Prickly chayote is native to Mexico and Central America, and its first cultivation was during the Aztec Empire of pre-Columbian times. It was then spread across the world via explorers and immigrants, and in the eighteenth century, it was grown extensively in Jamaica where it was known as chocho. It was also exported around the same time from Jamaica to markets along the eastern seaboard in North America in the nineteenth century. 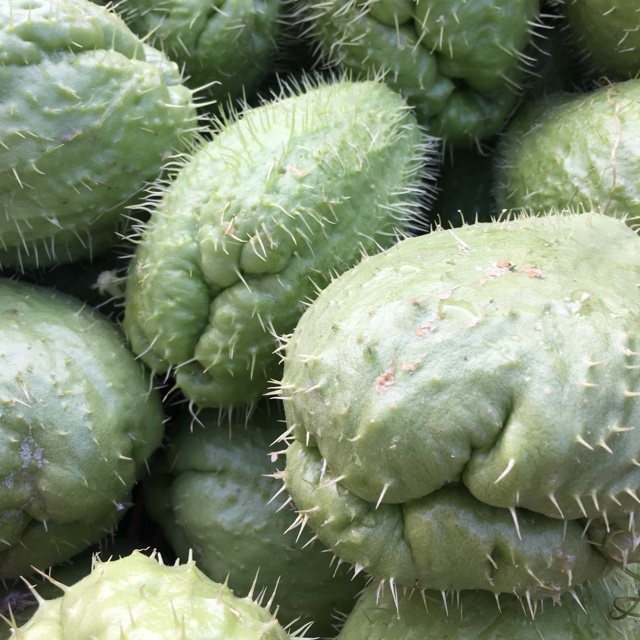 Today Prickly chayote can be found at local markets and grocers in North, South, and Central America, Africa, Europe, Asia, and Australia. Recipes that include Prickly Chayote Squash. One is easiest, three is harder. People have shared Prickly Chayote Squash using the Specialty Produce app for iPhone and Android. 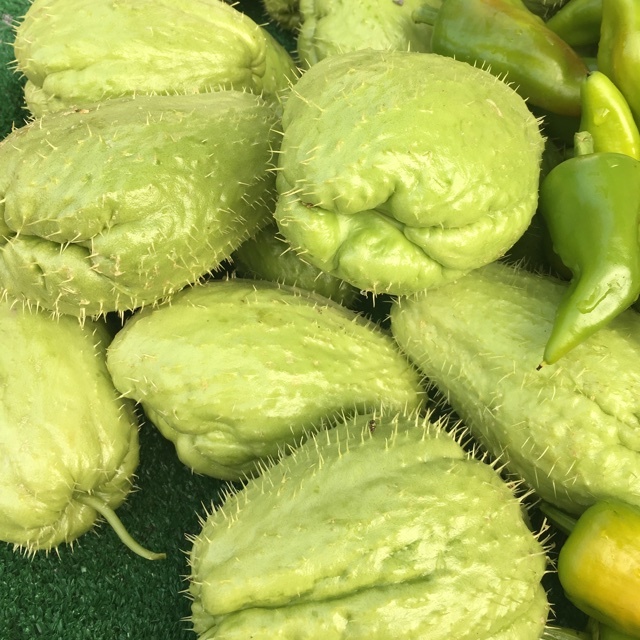 Sharer's comments : Prickly Chayote Squash spotted at Virginia Park Farmer's Market. 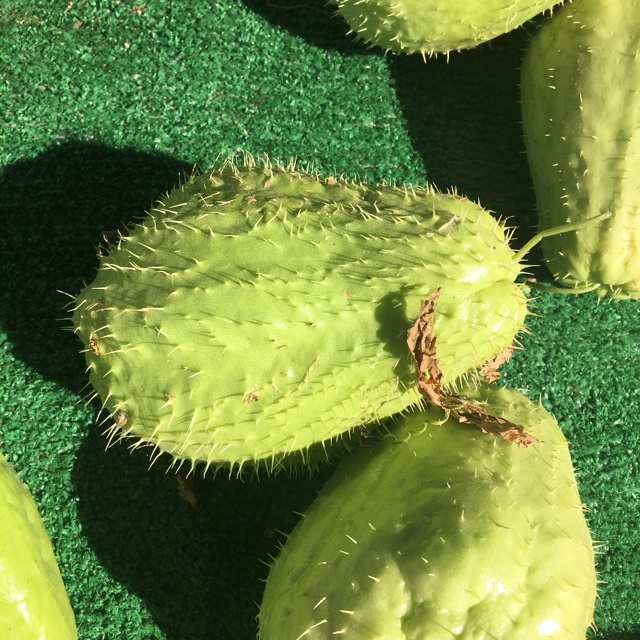 Sharer's comments : Prickly Chayote Squash spotted at Santa Monica Farmers Market.